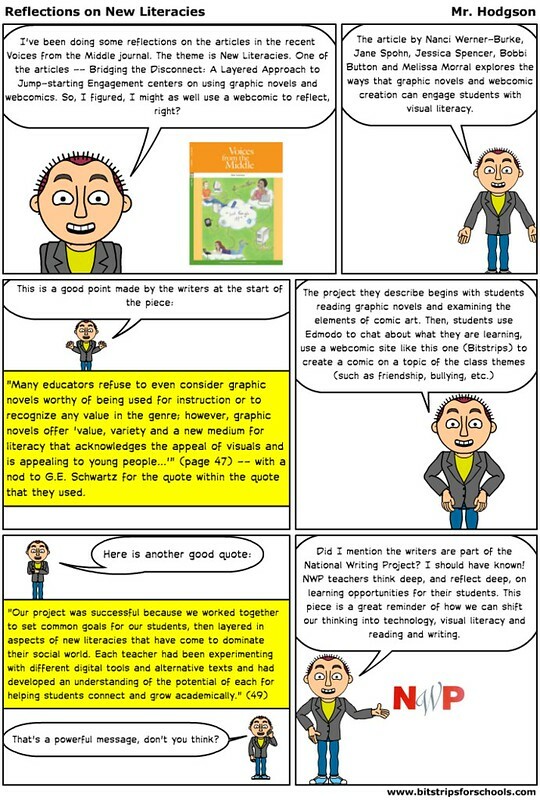 For today, since the article dealt with graphic novels and webcomics, I am creating my reflection on BitStrips. That seemed appropriate. I want to point out that the comic element was just part of the overall use of media, and the writing did not stop on the page. It extended into a networking space, stretching out the sense of audience and collaboration, and connections. I think this is important to point out. When the audience for work is pushed beyond just the teacher, and even the other students in a classroom, young writers and creators are motivated in a different way, and that can make a different in the quality of learning being done and shown. None of the sites and tools used here were done in isolation; they were part of a technology quilt. This is tricky to do — to bring various elements together and make them work seamlessly together — but when done right, it makes all the difference in the world. Thanks for emphasizing the point with your own art! Love the thinking about New Literacies in your own graphic novel format. Thanks so much for sharing. Pingback: Reflecting on New Literacies 3: from NCTE Voices from the Middle | Tommy found a real book.